Blackjack is one of the most popular casino card games in the world. You may find blackjack tables in every land and online casino, as they are established there from the very beginning of the casino history. It is not difficult to learn its rules and learn how to play, but it's not enough for successful play, as you should know the basic strategy of a game. The basic blackjack strategy helps players to do most profitable decisions and determine when to Hit, Stand, Double Down, Surrender or Split. Knowing blackjack basic strategy you'll be able to make proper decisions in each playing situation and you winning chances will arise. The strategy charts advice how to play player's first two cards and the dealer's first one. You have a great opportunity to become familiar with a set of advice how to play different card combinations. Ace 8 or Ace 9 - always Stand. Aces or 8s - always Split. 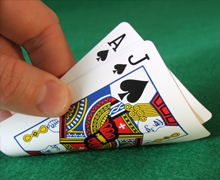 Hope, our schemes will help you to memorize blackjack strategy and use it on practice.